On last night’s episode of 18 Kids and Counting, the first Duggar grandchild entered the world. Mackynzie Renee Dugar was born on Thursday, August 18th and is the first grandchild of Jim Bob and Michelle Duggar’s eldest son Josh and his wife of one year, Anna. Josh and Anna may or may not to be set to follow in the elder generations footsteps; although both have set that they would be happy to have a big family, both having been raised in one, on the show, they have also said that they’re “not looking to set any records” and would be happy with “just one or two”. They have also yet to confirm or deny if all of their children will receive “M” names, following in another tradition of the Duggar family who named all their children beginning with the letter “J”. Michelle Duggar, baby Mackynzie’s grandmother, is also pregnant with her 19th child who should be approximately 5 months younger than his/her niece. This week, via the TLC website, Michelle Duggar requested suggestions from fans both both boy and girl names for the 19th Duggar child. It’s all coming up baby in the Duggar family this week! 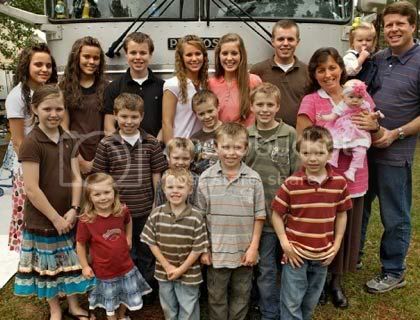 Despite the fact that Michelle Duggar thought that she would stop with 18 kids, TLC was right not to remove the “and counting” portion of the show’s title, because the mom of 18 is pregnant with her 19th child! She recently made the announcement on her blog on TLC’s website explaining how the new addition will affect the rest of the family. By now you may have heard: we’re expecting another baby! Can you imagine? I thought my baby years might be behind me, but now we’ve learned we are expecting baby #19 in March! Right now, I’m feeling sick and tired, which means things are happening! I keep that perspective to get me past that three-month mark. A lot of women feel different, depending if it’s a boy or a girl. For me, it seems with each pregnancy, from about the sixth week to the twelfth week, I feel that nausea and queasy feeling. I keep almonds in my purse, and I don’t know if it’s the protein, iron, or whatever, but it keeps me going. I might snack on pretzels, and small little bits of protein during the day. Of course, I am exhausted. So, when the little ones nap, I try to take one, too. My cravings aren’t strange. In the beginning, it’s always pickles or lemons, things that are sour or salty. After that, I’m not really interested in anything particular, just concerned with getting enough protein and calcium, so I’ll eat more cottage cheese, yogurt and stuff like that. I make a strong effort to eat a balanced, healthy diet, and eat the right snacks. I’m just thankful. I dont take this experience for granted, ever. I cherish that I have the time and ability to play with my children and be active for them. I don’t take pregnancy for granted, either. I thought we might be done. I was a little sad about it, but I just accepted it was a stage of my life and perhaps God felt my family was complete. I had a very light cycle, and truly thought I was done having children. I took a test, just on a whim. Something made me question it. I told Jim Bob right away, and he was so excited, he couldn’t hold it in. We told the children right then, and they were excited, too. I know Jordyn won’t understand. She’s only eight months old, and far too little to figure out what is going on. But I think Jennifer will love to see my tummy getting bigger. 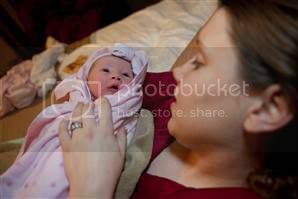 Last pregnancy, my little guys talked to the baby through my belly button, and I’m sure she’ll think that’s wonderful! is just tickled. She’s all into her babies, and she says this is going to be a girl! I think it’s just her wishful thinking. All of the sudden, it seems the number 18 is lucky for us. I am due on March 18, 2010; Josh and Anna’s baby is due on October 18, and our last little one, Jordyn, was born on December 18. Something about that number right now is working for us. You know, it’s funny being pregnant when expecting our first grandchild. If my mom were here, she’d be crying. This is just like my mom and my sister. My oldest sister Pam was expecting when my mom had me. My nephew and I are 3 months apart, and I have a nephew and a niece older than me! I grew up with my nieces and nephews around all the time, and we were all so close. I wish that for my grandchild and this baby. Anna is really such a cute pregnant mommy. She has only seven weeks left. They’ve taken all their classes on natural childbirth and we’re just hoping for uneventful, healthy delivery for her, and then for me! We were blessed with a healthy delivery just eight months ago. Check it out here.